What do members of ﻿a church choir do when they want to raise money for church funds?.......form an Operatic Society!! On 22nd September 1933, members of th﻿e choir of All Saints Church in Chigwell Row, Essex met and formed the All Saints Operatic and Dramatic Society, with the aim of presenting operetta and plays to the public. Rehearsals began soon afterwards for our very first production, which was Phillida, performed on Friday, 27th April 1934 in the All Saints’ Schoolroom, Chigwell Row. A small hall that was next door to Hainault Hall. Shows continued apace during the 1930s with such shows as Dogs of Devon, Highwayman Love and Merrie England. However, the performances stopped for the duration of World War II. War failed to dampen the acting spirit and rehearsals started again soon after the war ended. 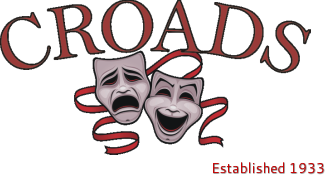 The members took the opportunity of the new beginning and decided to rename the society, the Chigwell Row Operatic and Dramatic Society (CROADS for short), the name we continue to use today. Home for the company was the All Saints’ Schoolroom in Chigwell Row until it closed in 1958 and during this time the Society began to make its name producing such shows as Tom Jones, The Gondoliers and School for Scandal. The stage used was unbelievably small, yet the company effortlessly put on these productions. In 1959, following the closure of the Village Hall in Chigwell Row, the Society moved home to its present venue, the Victory Hall in Chigwell becoming the first regular user of this newly built hall. The new home brought with it an increase in stage size, though most people would say that the current stage reminds them of a pocket handkerchief! It has been since then that the Society has made its name in its ability to produce high quality Gilbert & Sullivan, gold and silver age Viennese operetta as well as becoming specialists at presenting farce. In latter years the Society has branched out into 20th Century American musicals. The Chigwell Row Operatic and Dramatic Society celebrated its 80th anniversary in 2013, a milestone for any operatic and dramatic society!